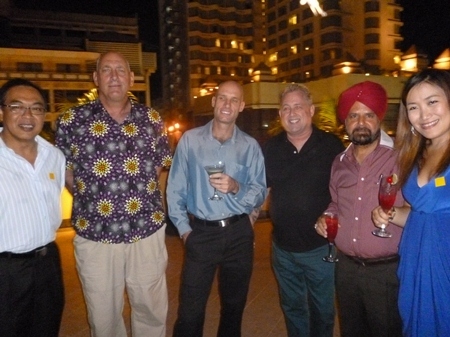 British Honorary Consul Ben Svasti Thomson (left) is joined by Advisor to the Governor’s Foreign Relations Office Maj. Gen. Bhumiphat Chawiphat at the cocktail reception. No stranger to Chiang Mai, Ambassador Mark Kent spent two months here studying Thai before starting his post in Bangkok, he was happy to be back on his first official visit outside of Bangkok since starting in August. He noted in an interview with the press that the past few months have been very busy ones as Foreign Secretary William Hague visited Thailand and then he accompanied Prime Minister Yingluck Shinawatra on what he felt was a very fruitful trip to London. U.K. 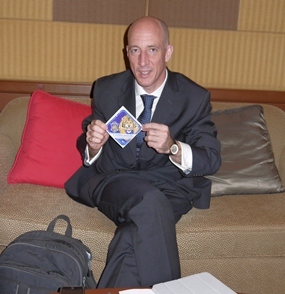 Ambassador Mark Kent is a Chiang Mai Football Club fan. He noted that the Prime Minister had shown a clear interest in pushing forward the long-stalled EU Free Trade Agreement and that she had given indications that the discussions would begin in the New Year. He was in town to meet with the Governor, Police and Immigration officials on the issues that concern British nationals including the high number of resident expats living here and the bureaucratic hurdles they must overcome as well road accidents and elderly indigent British citizens. He said that on average one British citizen died per day in Thailand, usually from natural causes he was quick to add. 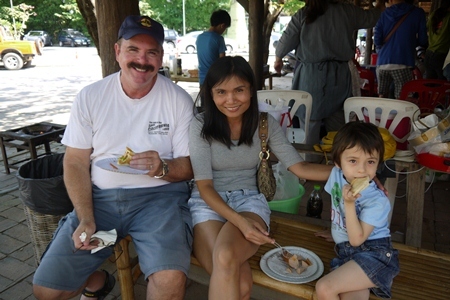 The Ambassador reported that the Thai Immigration would be interested in foreign volunteers to help explain things to foreigners; they are looking for native English and German speakers as well as any other languages that would be interested in helping. The British Honorary Consulate can help facilitate that. 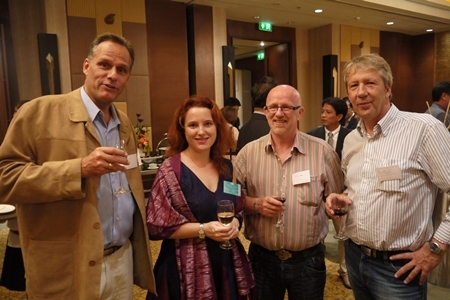 The Ambassador attended a cocktail reception organized by the British Chamber of Commerce Thailand and by the Honorary Consulate at the Shangri La Hotel on Monday, November 26, 2012 that saw around 70 attendees including local business people and members of the Lamphun and Chiang Mai Chambers of Commerce. Peter van Loo of Brainwave Exports chats with Lamorna Cheesman about exporting at the reception, they are joined by two friends of Peter’s from the Netherlands; Huub and Robert. 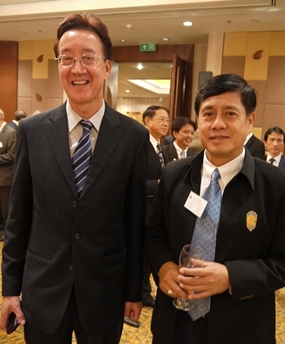 Members of the Chiang Mai Chamber and the Lamphun Chamber join the U.K. 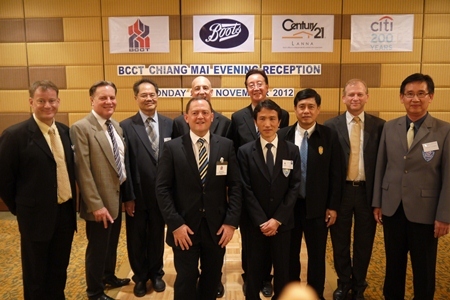 Ambassador and British Chamber of Commerce of Thailand members and executives at the end of the evening. 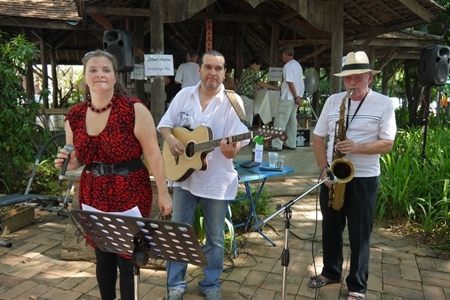 Ana Gracey and her band entertained the crowd of families, friends and shoppers. The Christmas Fair moved to JJ Market this year and it proved to be an excellent venue for the event, with plenty of shopping, food and best of all, parking! The fundraising Christmas Fair exceeded expectations with organizers sharing that they had garnered ten percent more than predicted. The funds will go to benefit disabled Thai veterans through the Royal British Legion and Lanna Care Net which works to help aging, infirm and indigent foreigners resident in Chiang Mai. 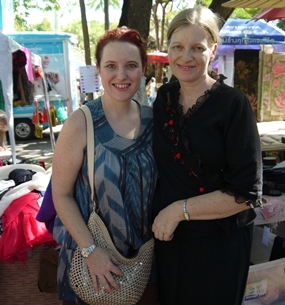 There were many stalls selling used and new goods as well as businesses offering services, nonprofit organizations including Care for Dogs with puppies, and restaurants such as the Steak House, Butter is Better, kebabs and Thai food. The incomparable Ana Gracey entertained the crowd and silent auctions were held with many very nice donated prizes including buffet lunch at the Dusit d2 hotel, spa treatments, massages and more. Finally, there were raffle prizes handed out and with a few more prizes on hand, raffles will be held at upcoming Royal British Legion meetings. 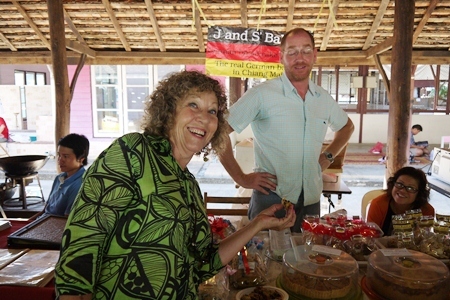 Jennifer was eyeing the German stollen at J and S Bakery’s stand. Dave and his family enjoyed a hotdog from the Steak House. Lamorna Cheeseman had a stall selling second hand goods and also many unique and lovely items from her shop Adorn at Studio Naenna. 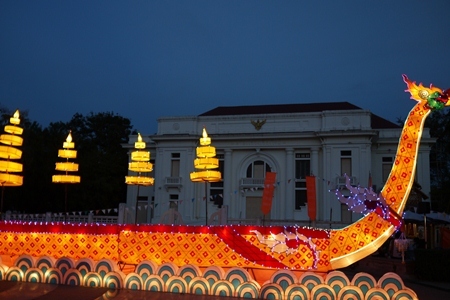 The Royal Barge Lantern Sculpture at the 3 Kings Monument lights up the area and honors HM the King on this, the year of his 85th birthday. 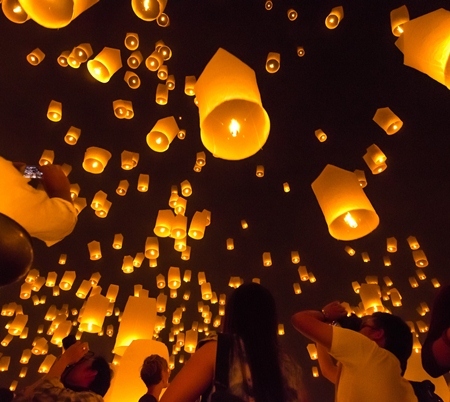 Yi Peng, or Loy Krathong as it is known around the rest of the country, is a special time in Chiang Mai where the city streets light up with color and glow with mystical creatures poised at the gates and in the moat. 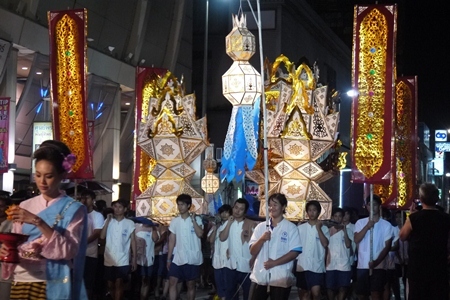 Parades fill the city streets and Khom Loy fill the night skies. 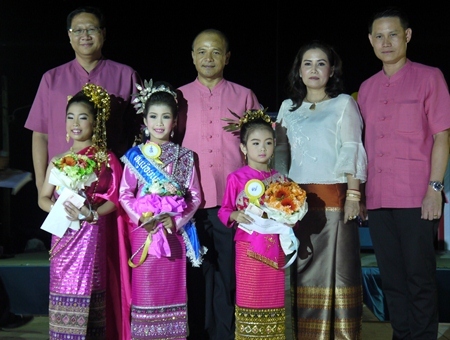 The event features two parades; the Grand Parade which took place after the deadline of this newspaper and the Small Krathong Parade, Mr and Miss Yi Peng contests, children’s contests, and traditional performances. 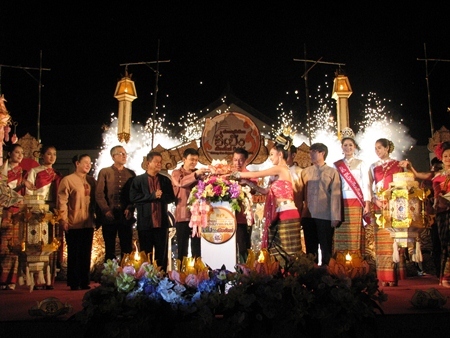 The President of the Chiang Mai Provincial Administration Organization Boonlert Buranupakorn and Mayor Tussanai Buranupakorn set the lotus flower in place to launch the Yi Peng 2012 Festival at 3 Kings Monument on opening day, Sunday, November 25, 2012. Wing 41 Commander Prayoon Thammathiwat held Loy Krathong Festivities at Wing 41 for personnel and their families with a Little Miss Loy Krathong contest seeing many very cute girls in traditional costumes to Miss Loy Krathong with lovely young women and Mrs. Loy Krathong. There was a Laab contest as well along with food and drinks. Parades fill the city streets as schools and organizations vie for the most beautiful and traditional styles. Skål, the travel and tourism professionals organization held their Annual General Meeting at Le Meridien on Wednesday, November 21 where they elected three new committee members and discussed finances and plans for next year as well as finalized the upcoming Christmas Party at the Four Seasons on December 14, 2012. Tim McGuire of Segway Gibbon, Frans Betgem, General Manager of Tiger Trail Thailand and Shana Kongmun, Managing Editor of the Chiang Mai Mail were elected as new committee members for Skäl Chiang Mai and the North. The meeting was preceded by a cocktail party attended by both members and non-members alike with many new faces visiting including Barry Main of Vizon Media, as well as many regulars including Lamorna Cheesman of Adorn at Studio Naenna who announced a textile show at Studio Naenna, Andrew Bond who is launching a new course on travel writing at Unitefl and Frank Sethi of Fashion King who announced the upcoming Bollywood Spectacular Party to be held at the Empress on December 10 by the Lions Club Saraphi to aid charities. 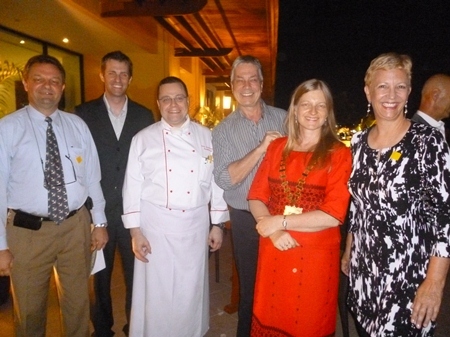 The evening concluded with a spectacular meal at La Favola at Le Meridien headed by Executive Chef Peter Zimmerman and overseen by Michael Hofsteter and Winfred Sanders. The event saw more than 40 members and guests attend and many stayed on to enjoy the fine coffee and wines after dinner was concluded. Nanthapol Charoenpakdi (far left) travelled up from Bangkok to join Skål regulars for the rooftop cocktail hour. The monthly group photo meeting of all Skål meeting attendees at Le Meridien on November 21, 2012.